These are some of the most common surgeries that are referred to us. We also perform other surgeries as well. Please call us at (727) 447-0256 for more information. 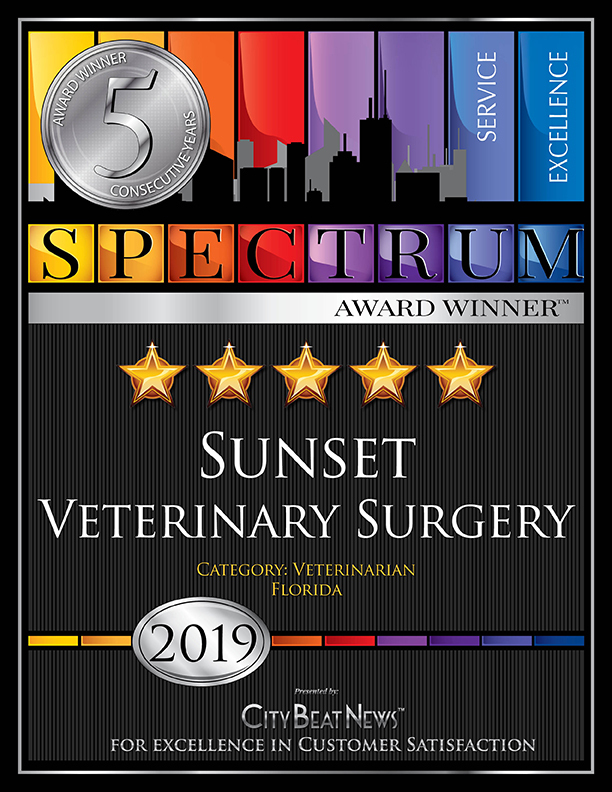 TTA is one of the most common procedures done by Sunset Veterinary Surgery. Smaller dogs and cats are repaired using suture material placed outside the joint in a manner so that it supports the joint in a similar way to the cranial cruciate ligament. The condition known as medially luxating patella is when the kneecap goes out of its proper position and rests on the inside (medial) of the knee. This condition is also known as medial patellar luxation or MPL. If you put your right hand on your own right kneecap, you can feel it located in the middle of the knee. Now move your hand to the left side (inside or medial) of your right knee. This is where a medially luxating patella rests. Your dog may seem to run normally to you except that once in awhile he or she may pick up a leg and carry it for a bit. Luxating Patella repair is one of the most common procedures done by Sunset Veterinary Surgery. This is a procedure for hip dysplasia and hip fractures in dogs and cats. The femur is the thigh bone. The hip joint is a ball and socket joint. The head of the femur is the ball. In this surgery the head of the femur is removed (Os means bone; ectomy means remove) allowing a false joint to form. FHO surgery is performed to alleviate pain. It is also performed in cases of trauma where the head of the femur is severely broken or malformed. Fracture is another name for a broken bone. Most fractures that are referred are the ones that are more difficult to repair and require specialized equipment. The doctor will determine the best way to repair a fracture after he examines the patient and reviews the x-rays. Laser treatments are a newer form of pain relieving therapy in veterinary medicine. Laser therapy decreases inflammation and promotes healing. How many of this type of surgery has the veterinarian performed? How recently has the veterinarian performed this type of surgery? Does the surgery require specialized equipment that’s readily available to the veterinarian? What are the risks involved in this type of surgery? What post-surgery care is required and for how long?